Looks like competition in the e-book reader market is heating up, with Sony making further inroads into this niche segment by enlarging its Reader family of e-book readers with the introduction of the Reader Daily Edition. This highly-anticipated wireless model will feature 3G connectivity, and will accompany its other two siblings, the Reader Pocket Edition and the Reader Touch Edition that were announced earlier this August. While the latter two models are already readily available at this moment, folks who are looking forward to the Reader Daily Edition to give Amazon’s Kindle and its successor will have to wait until December for it to be released during the holiday season. The Reader Daily Edition will enable consumers to access AT&T’s 3G mobile broadband network wirelessly, connecting to Sony’s eBook store as long as they are within a decent signal range, which would practically mean from just about anywhere in the US where AT&T are concerned. I’m sure that some readers who subscribe to AT&T’s 3G service will beg to differ, but let’s leave that in the comments, shall we? Users can browse, purchase and download books while selecting various newspapers and magazines to read on demand. You won’t have to worry about additional burdens on your finances since there are no monthly fees or transaction charges for the basic wireless connectivity option. Another feature includes the option to side load personal documents or content from other compatible sites through USB connectivity. You will find a 7″ wide touchscreen display gracing the Reader Daily Edition which ought to be more than ample for folks who want an intuitive navigation experience. That amount of viewing space also ensures a comfortable layout of content, regardless of whether you’re reading newspapers or magazines. In portrait mode, one is able to view anywhere from 30 to 35 lines of text, making one feel as though he/she is reading a printed paperback book. 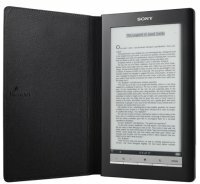 Other features include a high contrast ratio with 16 levels of grayscale, sufficient internal memory to store up to 1,000 eBooks and a memory card slot. Come December, you can pick up the Sony Reader Daily Edition for approximately $399.